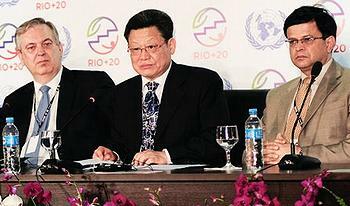 RIO de JANEIRO, Brazil, June 22, 2012 (ENS) – Practical actions agreed by government leaders in the Rio+20 final declaration will begin “immediately,” Brazil’s Environment Minister Izabella Teixeira said today. “We have methods and deadlines to be met until we complete the process that will be consolidated in 2014 or 2015,” she said as the United Nations summit on sustainable development concluded in Rio de Janeiro. Heads of state and high-level officials of more than 190 nations today approved the Rio+20 outcome document, entitled “The Future we Want,” after more than two years of intensive negotiations. The agreement will lead to creation of a High Level Forum to act as a watchdog for sustainable development commitments, a plan to review patterns of consumption and production, and a strategy to define Sustainable Development Goals. There is a new strategic status for protection of oceans, and there will be efforts to outline a new inclusive metric to measure the wealth of countries beyond Gross Domestic Product that incorporates the three pillars of sustainable development – economic, social and environmental. The agreement green lights a Green Economy in the context of sustainable development and poverty eradication. Nations agreed that such a transition could be “an important tool” when supported by policies that encourage decent employment, social welfare and inclusion, and the maintenance of the Earth’s ecosystems from forests to freshwaters. The crucial role of biodiversity in ensuring sustainable development is recognized in the outcome document, which calls for greater efforts to implement the Convention on Biological Diversity. Words of support for protection of oceans and forests as well as dry and sub humid lands that support biodiversity are included in the agreement. Brazilian President Dilma Rousseff said that in a multilateral world and at a moment when is difficult to get consensus, it is important that Rio +20 has been able to produce a single document. “This document is a starting point, non-arrival. It does not mean that countries cannot have their own policy. It is a document on the environment, sustainable development, biodiversity, poverty eradication. You must have a starting point. What we require is that, thereafter, the nations move forward,” she said. 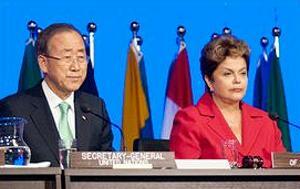 President Rousseff did not comment on the statements of UN Secretary-General Ban Ki-moon, who said the document could be more ambitious and that Brazil would have to be accountable. “I’m very grateful and encouraged by world leaders for their strong political commitments to agree to a solid outcome document which puts all of us towards a greater sustainable path,” Secretary-General Ban said in an interview. 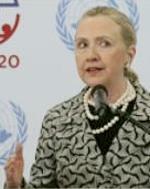 Today, Clinton helped launch a partnership between the United States and African nations that will use $20 million in U.S. Government funding that she said would “unlock hundreds of millions of dollars in private financing for clean energy projects in Africa” as part of the U.S. contribution to the UN’s Sustainable Energy for All initiative. 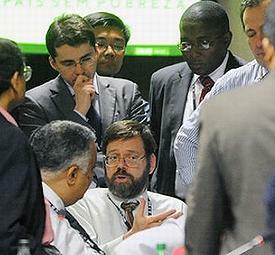 Minister Teixeira challenged each government to do more than what was agreed at Rio+20. “It is easy to say that the document is unambitious, but no one sat down at the table to commit additional funding. What I saw were the developing countries making sustainability commitments and no rich country adding resources to this process,” she said. Sha emphasized the importance of contributions made by civil society. As of early afternoon of Friday, 692 voluntary commitments were made by nongovernmental organizations, companies, financial institutions and development agencies. The promises of actions and targets aimed at sustainable development total US$513 billion, according to balance sheet presented by the United Nations. Of the funds committed, $323 billion will be devoted to achieving universal access to sustainable energy by 2030. Pledges include planting 100 million trees, empowering 5,000 women entrepreneurs in green economy businesses in Africa, and recycling 800,000 tons of the plastic polyvinyl chloride, PVC, per year. 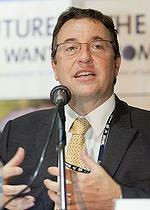 Achim Steiner, who heads the UN Environment Programme, UNEP, recognized the frustration of civil society groups that walked out of the official Rio+20 meeting hall on Thursday and demonstrated in the streets of Rio all this week, seeking greater human rights and environmental protection. “The outcome of Rio+20 will disappoint and frustrate many given the science, the day-to-day reality of often simply surviving as individuals and as families, the analysis of where development is currently heading for seven billion people and the inordinate opportunity for a different trajectory,” Steiner said today. “However if nations, companies, cities and communities can move forward on the positive elements of the Summit’s outcome it may assist in one day realizing the Future We Want,” he said. After four decades of discussion , governments decided to upgrade UNEP in key areas such as universal membership and improved financial resources. “This is welcome as one important way for improving the authority, the influence and the impact of the world’s ministry responsible for the environment in terms of moving development onto a more sustainable track,” said Steiner. 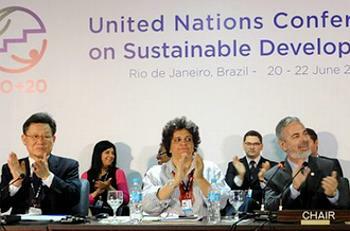 Meanwhile in Rio, the World Congress on Justice, Governance, and Law for Environmental Sustainability, hosted by the Brazilian Supreme Court and UNEP, committed to use international and national laws to advance sustainability, human and environmental rights and the implementation of environmental treaties. At the Congress, some 200 chief justices, senior judges, attorney-generals, chief prosecutors, auditor-generals and senior auditors called on governments to back an Institutional Framework for the Advancement of Justice, Governance and Law for Environmental Sustainability in the 21st Century. Today, Brazil and the UN Development Programme launched a global center for sustainable development that will have its headquarters in Rio. Minister Teixeira and UNDP Administrator Helen Clark opened the Global Center for Sustainable Development, called the Rio+ Center, during a ceremony in Rio. The Rio+ Center will facilitate research and serve as a knowledge base to stimulate the global debate on sustainable development.